Motor racing, football, music, beer. Nice to see Ivan Lintin get a win, and a hard fought one at that. What about JM? Just that afternoon my dad and I were writing him off and saying his days as top dog were over. Absolutely delighted to be proved so wrong : ) Best wishes to Jamie Hamilton. He's quite a character. Hoping he pulls through. Totally wrong about William but Bruce done it at last on the big bike : ) James Hillier seemed pretty emotional about his podium. I think William is a serious contender for a win on that BMW. Hope Bruce gets the Senior at last. Have a great time. I'll be shouting for Bruce Anstey as usual. Cool guy. Anyone off to the Isle of Man this year? I can't make it but have sponsored a couple of teams. Mark Saunders/Marc Maier (sidecar) and Colin Stephenson (Supersport/Superbike). Hope everyone has an enjoyable and safe fortnight. Jean-Pierre Beltoise has passed away. Despite having a severely weakened arm (the legacy of a crash early in his career) he went on to become a regular in F1, scoring BRM's final win at Monaco in 1972. He married François Cevert's sister. Since I started watching; 1. Ayrton Senna. Standing at the old Bridge corner at Silverstone and watching him drive around the outside of someone in the wet is an image that will stay with me to the grave. Seemed an immensely complex character but I reckon he was basically a very decent human being, albeit ruthless on the track. Eric Comas credits Senna with saving has life at Spa when he stopped his car and ran to help the Frenchman who had crashed heavily and was unconscious with his foot on the throttle. Senna switched off the engine and administered basic first aid he'd learned from Sid Watkins until help arrived (this incident is shown during the closing credits of the Senna movie). Did a huge amount to help and raise awareness of poverty in Brazil. I know many didn't, but I really liked the guy. 2. Jean Alesi Seems unfathomable that he only won a single GP. Talent to spare and a nice guy to boot. If only he'd chosen Williams over Ferrari in 1991. 3. Riccardo Patrese Always had a soft spot for Patrese, which may have had something to do with disgusting bile spouted about him by James Hunt on occasion, who blamed him for causing Ronnie Peterson's fatal accident. On his day he could be as fast as anyone. In 1991 he had the upper hand over team-mate Mansell for much of the year. 4. Michael Schumacher What some saw as arrogance I believe was extreme confidence. He was a machine and rebuilt Ferrari. 5. Mika Hakkinen For a while the only driver who could challenge Schumacher. A remarkable career, coming back from a near fatal crash in 1995 to take two world titles. Always seemed very humble and who could forget him crying in the bushes at Monza. Top 5 of all time; 1. Gilles Villeneuve My dad used to show me videos of Gilles which is what got me interested in the sport. Apparently fearless and completely unwilling to give up, even with a wheel missing! 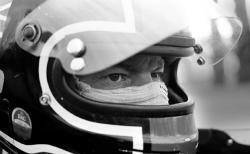 At Watkins Glen one year during wet practice he was 11 seconds a lap quicker than anyone! 2. Dan Gurney The only man Jim Clark feared, 'nuff said. A complete gentleman and went on to create AAR. My son is named after him. 3. Ronnie Peterson I've never heard a bad word about him. Unbelievable car control, had plenty of flies on the side of his helmet : ) Agreed to play second fiddle to Andretti in 1978 , otherwise could have been world champion. His death at Monza was an avoidable tragedy which his wife never really recovered from. 4. François Cevert Effortlessly stylish, on and off the track. Also a concert standard pianist (like Elio de Angelis). Would have finally emerged from Stewart's shadow in 1974, possibly with a world title. 5. Bob Anderson A character who fascinates me. Was a very competent bike racer in the 1950s before, like Surtees, switching to cars. Recruited a couple of mates from his local pub as mechanics, loaded his Brabham onto the back of a VW transporter and joined the F1 circus. Incredibly, he actually made it onto a world championship podium with 3rd place at the 1964 Austrian GP. Ran his operation on a shoestring with the Brabham becoming increasingly obsolete. Deserved a better fate than what befell him while testing at Silverstone in 1967. His mechanic's account of the 'rescue' operation is one of the most harrowing things I have read regarding the sport.